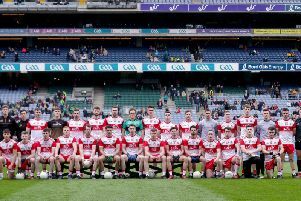 Tyrone advanced to the second round of the All Ireland qualifiers on Sunday afternoon with a 1-14 to 0-8 victory over Limerick in Healy Park. In what was a dour contest the Red Hands made heavy weather of overcoming the Division Three side pulling away to win in the second half. Mickey Harte’s side saw Clonoe attacker Connor McAliskey top score with 0-6 for his side, while the contribution of Killyclogher forward Mark Bradley from the bench was praised by the manager after the game. Tyrone led by two points at the break, points from McAliskey, Sean Cavanagh, Mattie Donnelly and Darren McCurry helping them into a 0-6 to 0-4 half time lead. Limerick were wasteful in attack and kicked six first half wides hurting their chances of springing an upset. Tyrone pulled away in the early stages of the second half with McAliskey and Ronan O’Neill among the scorers before Peter Harte’s injury time goal put something of a gloss on the scoreline. Tyrone will meet one of Derry, Tipperary, Galway or Meath in Round 2B of the All Ireland qualifiers.